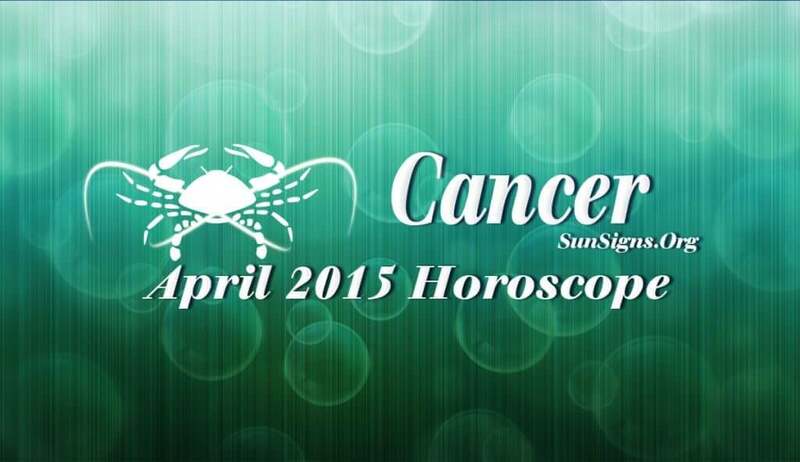 Cancer April 2015 Horoscope forecasts that you need not depend on others for your progress in life. You have your own life path and there is no need to adapt to situations or people. The planetary strength For Cancer zodiac sign people is in the Eastern half during the month of April 2015. More than 70 percent of the planets are in the upper half of your horoscope. Career will overshadow domestic and spiritual matters. Family members will be helpful in your professional matters, and you will have the support of your inner intuition. The Cancer career horoscope for April 2015 predicts that your career is zooming forward. You have the support of your associates and management in achieving your career objectives. Your work will be recognized and financial remuneration will increase. People seeking jobs will have a successful period. And so will Cancerians who are running a business. Relationships with co-workers will be excellent. The April 2015 financial forecasts for the Crabs foretell that monetary situation is fabulous till the third week of the month. After that it requires more effort to generate the same amount of money. Speculative investments will be profitable and there is a good chance of enhancing your wealth. In April 2015, singles will have many opportunities to form partnerships till the 21st of the month. You are looking at love as a means of professional growth. During the last week, love will be idealistic. Getting pregnant or caring for family will take a backseat this month. The April 2015 Cancer horoscope forecasts that your health will be excellent in the coming month. Be sure to get enough rest and relaxation. A change in habits and good fitness and diet regimes will be beneficial.